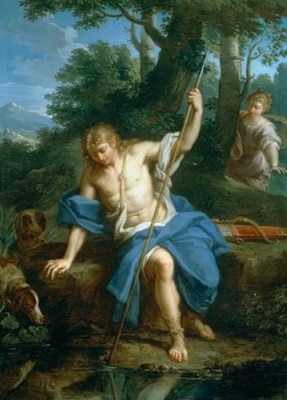 ...According to ancient mythology, a nymph named Echo was banished to the woods for being too talkative. Her voice was taken away from her, and she was restricted to only mimic the words of others. One day, Narcissus, a strong, handsome man, decided to travel through the forest where Echo lived, hunting stags. Noticing the handsome stranger and falling in love instantly, Echo followed him. Narcissus, feeling as though he was being watched, called out, "Who's there?" Echo repeated his words, calling, "Who's there? Who's there?" into the woods. This exchange of words and echoes went on for a short while, until Echo decided to reveal herself, running into the man's arms. Vainly, Narcissus commanded Echo to leave him alone, pushing her away. Echo was heartbroken, and spent the rest of her days pining for Narcissus. Another lesser known fact about the wild daffodil is that it is highly poisonous. Ingesting any part of this plant can be hazardous to the health of any organism other than an insect. Rabbits, cats, dogs, horses, and humans are just some of the victims of the deadly poison found in deceivingly beautiful Narcissus pseudonarcissus. Most cases of death or bodily harm result from the accidental consumption of daffodil bulbs, where the toxin is centralized. Daffodil bulbs look very similar to onions, and if people aren't careful, they can eat these harmful plants without realizing it. Bulbs are actually crucial to the reproductive process of the daffodil plant. To learn more about bulbs, please visit the reproduction page. There are several symptoms of the wild daffodil's toxicity, which can be noted in humans shortly after consumption. First, the victim will begin experiencing nausea and vomiting, a result of the body trying to rid itself of the poison. Diarrhea follows shortly thereafter, with dizziness and in rare cases, convulsions and paralysis. Most victims of daffodil poisoning recover after a day or so, having worked the toxin out of their systems. In more severe cases, concerning young children usually, the victim may perish if enough daffodil is consumed and the condition is not treated in an urgent manner. Animals too can suffer these symptoms, experiencing increased listlessness. Cattle have been known to die from daffodil poisoning if fed daffodil bulbs by mistake. So what makes the wild daffodil so poisonous after all? 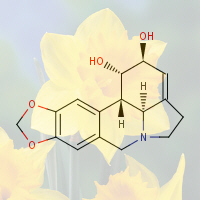 The answer lies in the daffodil's alkaloids, which are alkaline chemicals in the plant that bear nitrogen. Specifically, lycorine is the alkaloid that causes the most problems, affecting the nervous system. This alkaloid has intense emetic properties, meaning that it induces vomiting. Lycorine also can fatally inhibit protein synthesis. If you suspect that your animal or someone close to you is experiencing daffodil poisoning, it is important to seek medical attention immediately. Daffodils can also cause skin irritation, which is much more common than poisoning from ingestion. This ailment is explained more in detail on the interactions page. Other species of daffodils besides Narcissus pseudonarcissus also contain compounds that cause skin irritation and poisoning, so people should take caution when working with any Narcissus plant.